Author Jada Pasquale Yengkopiong has long been concerned with rising conflict in South Sudan. He was an eyewitness to the Juba Nuer Massacre in 2013. His book “The Golgotha: South Sudan 15 December 2013” covered the tribal politics of South Sudan. Now, in his new book, “The Terrorists Within: South Sudan’s Tribal Ascendancy” (published by Balboa Press AU), Yengkopiong aims to tell the truth about the Dinka regime who, the author explains, dominate South Sudan through their tribal politics. 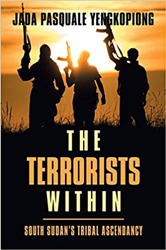 The book is available for purchase at: https://www.amazon.com/Terrorists-Within-Sudans-Tribal-Ascendancy/dp/150431655X/. Throughout the book, Yengkopiong underscores the growing threat of terrorism within the country, and provides a historical perspective on “the genocide occurring at the hands of terrorists in an often-hidden region of the world.” The author uncovers what he believes to be the intentions of the Dinka tribal regime, and documents the acts of tribal leadership that has inflicted great suffering on the region. Yengkopiong says South Sudan needs international attention if it is going to survive. Jada Pasquale Yengkopiong was born in Juba, South Sudan. He graduated with the General Certificate of Education from the University of London. He joined Makerere High School in Kampala and graduated with a Uganda Advanced Certificate of Education. He was admitted to the University of the Witwatersrand, Johannesburg. Yengkopiong is asking the people of the world to not ignore the tribal politics of South Sudan. He also asks that those involved in crimes against humanity account for their actions. In this way, he believes peace will prevail in South Sudan for generations.